I know we’re in July but I have had a little epiphany recently that has made me realise it’s ACTUALLY JULY. Time has gone by so quickly this year, and I’m already starting to see people saying “Only… sleeps until Christmas!” (I love Christmas, but I don’t need to be reminded that I’m not organised and Christmas is coming.) Now that I have found a job that I actually enjoy I’m determined to invest some serious time in my blog, and I mean serious time, but as much as I enjoy writing and reading making time for these things was never my strong point. 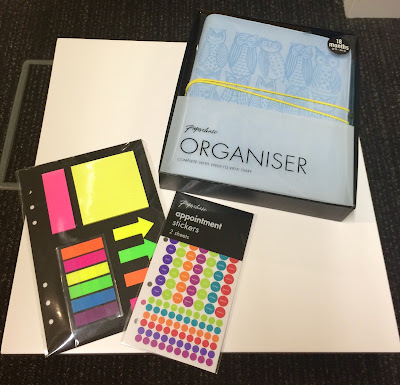 GETTING ORGANISED WITH PAPERCHASE I rarely go into Paperchase, more over the Christmas period because they have quirky brightly coloured things, but when I started my new job I found Tottenham Court Road Flagship store about 5 minutes away from the office. Bright colours over three floors – I was in heaven. Since I started fixing up my blog, I have been meaning to find a diary or an organiser but the ones I had seen just didn’t do it for me in terms of amount of space to write in and stickers/tabs to add. I’m determined to invest some serious time in my blog, and I mean serious time, so I was never going to leave the shop without something funky, bright and practical. I’ve only had it for a week but have written down content ideas for the rest of the month, put in cinema and gallery trips and added the staple dates like birthdays and my parents’ anniversary. I need to get some more stickers and decorations for my organiser but I’M LOVING IT! By writing down everything I am now making sure I stick to things I have planned so I don’t create a backlog or get lazy (procrastination is my biggest enemy) but this post is evidence! "Qoute of the day – Marilyn Monroe"
"Qoute of the day – Alexander Graham Bell"